As spring quickly approaches, you’re probably excited to start planning for warm weather days on the deck or patio. Whether you need to add a fresh coat of varnish to the deck boards or upgrade your tired patio furniture, it’s easy to envision outdoor entertaining in a fun, comfortable space. For your outdoor party to be a hit, give your guests a reason to want to stay outside. It’s not much of an outdoor party if your guests are constantly having to run in and out of the house. Make sure you have plenty of access to snacks and cold beverages outside as well as utensils and condiments. For those get togethers that run well into the evening, strings of party lights make a big impression. 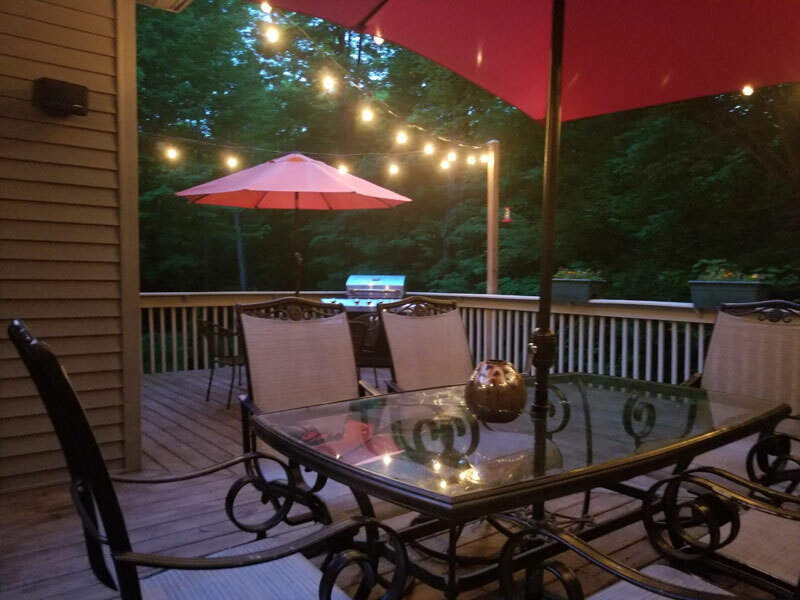 By hanging the lights around or above the deck, you provide much more light across the entire space than a single porch light would. Almost inevitably, there are always a few guests that seem to get cold very easily outdoors. Give your party goers a spot to warm up when the chill hits. There are lots of options for wood-burning or gas-fueled fire pits and fireplaces. Looks for options that work safely for your outdoor space. Daytime parties can be brutal if the sun is shining a little too much. Make sure your guests don’t leave with unintended sunburns or farmers tans by providing some covered areas. Over-sized umbrellas and seating placed under overhangs or tree shade are a must for keeping your guests cool and comfortable. What’s a party without some good music? It’s easy to crank the music a little too loud outside. Don’t let the your background music over power the party! Remember that party guests often want to talk and mingle with one another. Don’t forget to dress up the gathering by decorating your outdoor space. Use VZ Hang® Vinyl Siding Hooks to hang decorations on your vinyl siding and add a visual pop to your party!